SHUT DOWN I.C.E. – No dialogue with state terror! Celebrate People Power Over State Violence! 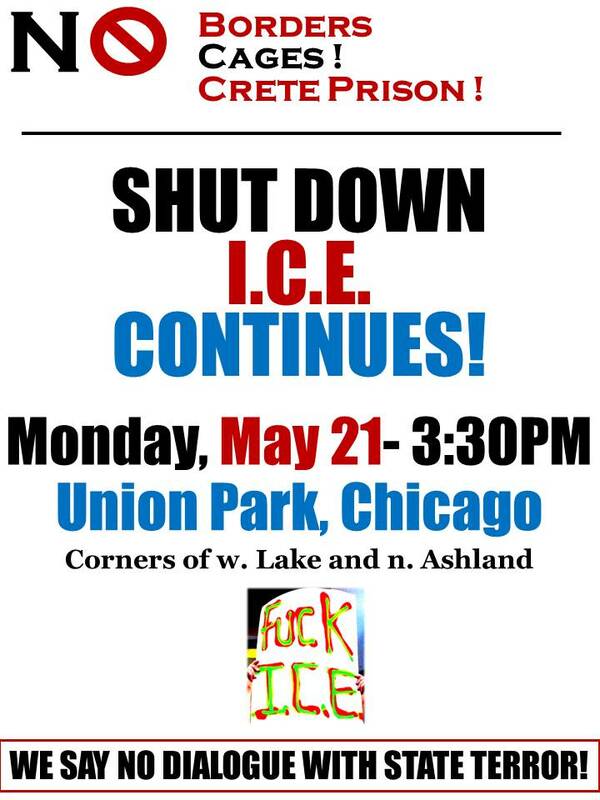 3:30 PM – Gather in Union Park, (W. Lake & N. Ashland) Off the Green and Pink train lines-Ashland Stop. 4:00 PM – Action steps off to downtown Chicago. They attack and terrorize our communities, and then call us a security threat. We have just witnessed a wave of state violence against peaceful demonstrators, and immigrant communities have been under attack for years. The true open, political process is represented by people standing up against the war at home and abroad, by social movements increasingly demanding, and creating, political change through direct public participation. The only “security concern” is a repressive system that criminalizes migration, poverty and political dissent. We will gather to celebrate people power in nonviolent, symbolic action over state repression. We will not cancel our SHUT DOWN ICE action! In addition, we will remind the Congressman that he endorsed the NATO protests and his father participated in them, as is expected of politicians claiming to be “progressive Democrats”. We demand that he either retract his unfounded, alarmist and misleading statements about anti-NATO and pro-immigrant advocates, or add himself to the list of parties his office considers a security concern. Calling us a security threat incites police violence against us. We consider the Congressman personally responsible for any form of repression or police attack we may encounter as we exercise our right to assemble today.